Wider. Faster. Longer time in the field. There’s no better way to run. Introducing our biggest anhydrous applicator ever: the all-new 2410C Nutrient Applicator. With widths up to 62.5 ft. (19 m), the new 25-row 2410C is a dramatic 47% larger than our previous model. Perfect to go from field to field in varying residue types and soil conditions. You run faster — up to 10 mph. That’s over 66% faster than the industry average. 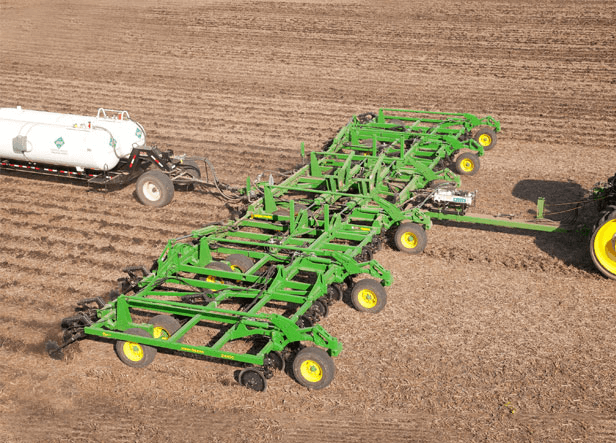 Your nitrogen application is precisely placed and sealed to boost yield potential. You run longer in the field, too. Get into the fields earlier, stay later in the season and run without stopping to clear residue plugs. Fully adjustable closing disks require no tools for virtually plug-free performance in virtually any soil type — wet, dry sandy, rocky. No adjustment tools needed. A deep frame design and staggered shank configuration also reduces plugging — even in wet and freezing conditions. Add tillage option in same pass. Now you can till and manage residue, and apply nitrogen all in one cost-saving pass. Simply spec the new 2410C with chisel standards. With Rate Controller and AutoTrac™, you’ll maintain precise application accuracy to boost yields, even in rolling terrain and uneven field conditions.